Peter Jackson has, if nothing else, made J R R Tolkien immortal. Not to take away from the great author himself, of course, but then again, who reads these days? Jackson has lovingly visualised two of the writer's books, and managed to earn plenty of goodwill - and money - in the process. The last of The Hobbit series, The Battle Of The Five Armies wraps up, neatly, all the events of the past two movies, and tells us there is more to come. But wait, that "more" has already come, since The Hobbit is merely a prequel to The Lord Of The Rings series. Confused? Not if you have been following Peter Jackson's career ever since he shocked us into awe with his first LOTR film. In this one, the story picks up from where it left off in the previous movie, and plunges us right in the middle of some heavy duty action. The dragon, as you know, has decided to awaken, and now it takes immense sadistic delight in destroying the village at the foothills of the Lonely Mountain. Bard the Bowman (Luke Evans), who is locked up in the village prison, manages to get out and eventually kill the dragon. The villagers want to name him the Master of the community, but he refuses, preferring instead to lead his people towards rehabilitation. In the meantime, Thorin (Richard Armitage), Bilbo (Martin Freeman) and gang are still up on the Lonely Mountain, watching the destruction below. They are powerless to do much, but Thorin concentrates on getting his kingdom in order. By the time the wounded Kili (Aidan Turner) and his companions reach the Lonely Mountain to reunite with their gang of dwarves, Thorin has already lost his marbles, somewhat. Gandalf the Grey Wizard (Ian McKellen) is still trapped in some spell, but he is rescued by the strangely powerful elf lady Galadriel (Cate Blanchett), who is helped by the elf king Elrond (Hugo Weaving) and the White Wizard Saruman (Christopher Lee). It is here that they encounter Sauron the Necromancer, who tells them that he is on his way to destroy the world. Gandalf then leaves to warn the unsuspecting dwarves and men of the impending assault by Sauron's troops, but when he reaches the Lonely Mountain, he discovers that the elf Lord Thranduil (Lee Pace) has joined hands with Bard to declare war on the dwarves, who have holed themselves up in the mountain. 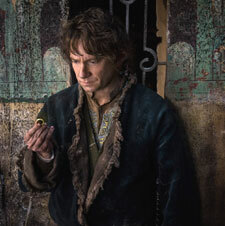 This is when Bilbo decides to take matters into his own hands, at the risk of incurring the wrath of Thorin. In the meantime, the orcs have their own plans. The main theme of the story is the darkness that takes a grip of living souls and sends them into despair. There is Thorin, who is so overcome by the sight of the gold in the Lonely Mountain that he forgets who he is and where his duties lie. He used to be an honourable dwarf, but now he goes back on his word, and becomes more and more self-obsessed. He has the dragon-sickness, and is desperate for the Arkenstone, so that he can reclaim his lost glory. Then there is Sauron, the prince of darkness in a way, who is just rising to power in his own world. The consequences of his increasing might will be seen in The Lord of the Rings, but this story gives us a glimpse of what he will be. Gandalf overcomes his own darkness, with the help of the very complex Galadriel. Bilbo, too, will face his share of darkness in The Lord of the Rings, of course, since he has the ring, and it is almost tragic that you already know that, since he is such a cute little thing here. The relationships in the movie are not very important. Actually, they are quite superficial, since the foundations have been laid in the previous films. The love story between Kili and Tauriel is rather abrupt, when it could have been a little plot about star-crossed lovers. 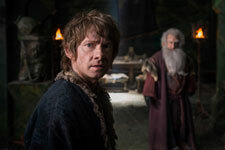 Bilbo's loyalty towards Thorin seems misplaced and forced. Even Fili and Kili do not exhibit any of the sibling affection they showed earlier. Gandalf largely ignores Bilbo, right up to the end, which is strange, because they are such go0d friends. The screenplay largely concentrates on resolving all the issues in the previous two movies. Which means that more than half the movie is abundant with battle sequences. None of the villains, however, is as intimidating as Sauron is in LOTR. Azog is the main antagonist, but despite the unusual intelligence that he is endowed with, he is not very scary. The dialogues and the humour in them are not very apt, and downright cringe-worthy in places. Martin Freeman looks lost in this movie, after being so prominent in the previous two. He has a few very emotional sequences to perform in, and he does a commendable job there. Ian McKellen and Orlando Bloom look tired, which is not a good portrayal of their characters, since they are supposed to be younger here when compared with their characters in LOTR. Evangeline Lilly pouts and sulks, and giving her company is Lee Pace. The scene-stealer, however, is Richard Armitage with his myriad mood swings and expressions. The other actors are mostly underused, and this is obvious only because they were given so much importance in the previous films. There is not much you can say about the visuals in the movie. They are familiar, predictable and, at the same time, top class. The camera work follows the same pattern of shots that you saw in the LOTR films. The battle sequences do not merit much comment, either. Then again, in 3D, you are certain to be awestruck, especially in the sequence where Thorin goes through an internal struggle in the golden hall, and in a couple of eye-level war sequences. The gradual whitening of the setting - from warm autumn to winter - is a pleasant surprise. The music is normal. This is a long movie, though not quite three hours, and the editor could have been less indulgent with repetitive shots. There is no point watching The Hobbit: The Battle of the Five Armies if you have not seen the first two instalments. As mentioned above, this is the concluding chapter, and you will be all at sea if you try to figure out why exactly Bilbo has a ring, and what the dragon's problem is. If, on the other hand, you do not really care about stories and just want to experience some great 3D visuals, you can give this movie a try, but we would suggest another recent release - Exodus: Gods and Kings. Be the first to comment on The Hobbit: The Battle Of The Five Armies (3D)! Just use the simple form below. fullhyd.com has 700,000+ monthly visits. Tell Hyderabad what you feel about The Hobbit: The Battle Of The Five Armies (3D)!